The Bills began discussing the idea of taking a quarterback near the top of the 2018 draft all the way back in May 2017 when general manager Brandon Beane was hired, Jason La Canfora of CBSSports.com. When it came time for the draft, the Bills managed to move up for Allen by sending their No. 12 pick and two second-round picks to the Bucs for the No. 7 choice. After that, the Bills doubted that they would be able to land Virginia Tech linebacker Tremaine Edmunds, who was another one of their top targets. Luckily for them, the Raiders opted to bolster their offensive line with the No. 15 pick, giving them an opportunity to trade up for Baltimore’s pick at No. 16. The Bills are happy with how things turned out in the first round, but it may take a while before we see how this draft class pans out, particularly when it comes to Allen. Texans quarterback Deshaun Watson tells NFL Network that he expects to be “full-go” for the first day of training camp (Twitter link via Adam Wexler of KPRC). Watson was able to practice without a knee brace during the team’s minicamp last month, so it was expected that he would be ready to roll for camp this month. Watson threw for 19 touchdown passes in his injury-shortened seven-game season and expectations are high heading into Year Two. Colts GM Chris Ballard says the team will have Chris McCain in training camp as his legal process plays out. “We’re getting two extreme versions of the truth,” Ballard said (Twitter link via Stephen Holder of the Indy Star). McCain has been charged with battery in California, but maintains his innocence. Patriots wide receiver Julian Edelman will not sue the NFL over his four-game suspension. Duke Johnson Jr. is staying in Cleveland for the foreseeable future. The running back signed a three-year extension with the organization today that will tack an additional $15.6MM ($7.7MM guaranteed) to his contract. While the 24-year-old is set to be with the organization until at least 2021, Johnson was more focused on his team’s potential in 2018. General manager John Dorsey also discussed the running back’s new deal. The Texans are looking like they’re going to head into the 2018 campaign healthy. NFL.com’s Ian Rapoport tweets that quarterback Deshaun Watson (ACL) and defensive end J.J. Watt (tibial plateau fracture) aren’t expected to start training camp on the physically unable to perform list. The duo combined for only 12 games last season. NFL executive vice president of business operations Eric Grubman will be stepping down from his role (via Charean Williams of ProFootballTalk.com). The executive, who has been with the NFL for 14 years, played a major part in the Rams’ move to Los Angeles.“He has handled some of the most challenging and important issues to the NFL,” said Roger Goodell. While the commissioner tried to convince Grubman to stick around, the executive will join former COO Tod Leiwicke and former executive vice president of communications Joe Lockhart among those who have left high-ranking roles. We learned earlier today that Broncos edge rusher Shane Ray is set to undergo wrist surgery, which will keep him out of action for three months. Jadeveon Clowney did not practice during the first set of Texans OTAs last week because of a surgery he underwent in the offseason, Aaron Wilson of the Houston Chronicle reports. Clowney had arthroscopic knee surgery after the season but remains sidelined as Houston’s offseason program commences, per Wilson, who adds the fifth-year edge defender recently sought a second opinion from Dr. James Andrews. While the additional medical counsel and the lengthy time off could be deemed a cause for concern, Wilson reports the outlook for Clowney is positive here. An extension for the former No. 1 overall pick has been on the Texans’ agenda for a bit now, and the team is eyeing what promises to be a landmark contract being finalized before the regular season. It doesn’t look as though this knee issue will cloud that. Although, no deal is imminent just yet. Here’s the latest out of Houston, as its NBA franchise prepares for a rather significant game. Raiders coach Jon Gruden is surprised to see Colin Kaepernick without a job in the NFL, but he’s not necessarily of the belief that he is starting caliber. Texans coach Bill O’Brien says quarterback Deshaun Watson is ahead of schedule in ACL rehab and could be on the field throwing for OTAs (Twitter link via NFL.com’s Ian Rapoport). It’s unlikely that he’ll participate in team periods, but he has a chance at doing some individual workouts. The Browns‘ two-year deal with Drew Stanton is worth $6.5MM, a source tells Rapoport (Twitter link). The deal includes $4.15MM fully guaranteed and carries a maximum value of $11.3MM. With Tyrod Taylor, Stanton, and a quarterback to be drafted later, the Browns are expected to shop Cody Kessler, Rapoport tweets. Kessler started eight games for Cleveland in 2016, but didn’t necessarily shine. Given Kessler’s performance and the fact that the Browns probably do not have him in their plans, I wouldn’t expect much of a trade market for him. Ian Rapoport of NFL.com (video link) says no one is exactly sure what the future holds for Colts QB Andrew Luck, who was recently placed on IR and ruled out for the remainder of the year. Per Rapoport, Luck has met with at least four doctors and has been advised that he should not throw for two to three months, though surgery is not in the cards at this point. Rapoport says all indications are that Luck will be healthy for the start of 2018, but Alex Marvez of Sporting News is not so optimistic. Because of the way the Colts publicly handled the situation, Marvez does not put much stock in reports that Luck will be ready to go by the start of 2018 — especially since he still cannot throw without soreness 10 months after surgery — and he says Indianapolis is facing the possibility of Luck never playing again at a high level and being on the hook for $87 million in salary guaranteed against injury. Chris Mortensen of ESPN.com tweets that Luck will be reevaluated in December, and that the Colts are “not ignoring” the 2018 QB draft class. The Colts claim that cornerback Vontae Davis is out for today’s game due to non-injury reasons, but Mike Florio of Pro Football Talk hears that is actually a cover-up for the fact that the Colts have not disclosed Davis’ lingering groin injury in recent weeks. Stephen Holder of the Indianapolis Star says there is more to Davis’ absence than the team is letting on, but he believes Davis’ absence is due to personal reasons and is not injury-related. Jaguars RB Leonard Fournette was deactivated for today’s game against the Bengals, and Jay Glazer of FOX Sports tweets that the star rookie missed treatment, a workout, and a team photo this week, which led to his benching. Head coach Doug Marrone is clearly trying to change the culture in Jacksonville, though Jags fans have to hope it doesn’t come at the expense of the team’s playoff push. Adam Schefter of ESPN.com tweets that Texans QB Deshaun Watson is expected to miss eight to nine months as a result of his ACL tear, though the last time he tore his ACL, he missed only five months, so Houston is hopeful for a shorter timeline. Jason La Canfora of CBS Sports says Broncos QB Paxton Lynch is under consideration to start in the team’s Week 10 matchup against New England, but Mike Klis of 9News.com says (via Twitter) that report is inaccurate. Klis reports that Lynch is not yet physically ready and that Brock Osweiler will keep the job if he plays well. As La Canfora writes in a separate piece, there are some Browns coaches who believe GM Sashi Brown intentionally scuttled the team’s near trade for A.J. McCarron, presumably because he believed the cost (a second- and third-round draft choice) was too high. Even if Brown is right about that, his efforts to intentionally sabotage the trade represent a massive breach of protocol and will only intensify the much-discussed rift between the team’s coaching staff and front office. But even if Brown did not act duplicitously, and even if the botched trade was simply due to human error, the fact that the coaching staff thinks Brown intentionally nixed the deal suggests things have gone beyond the point of no return in Cleveland. 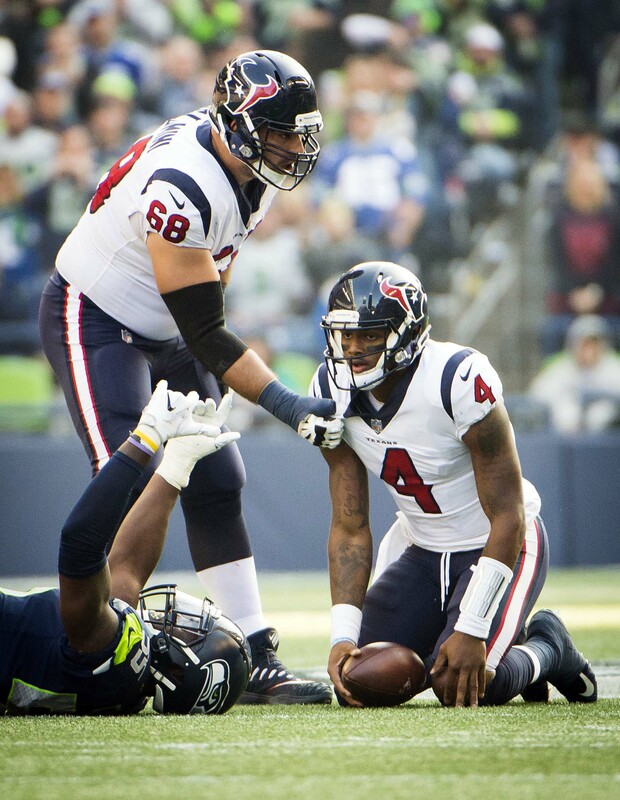 Deshaun Watson may have encountered a brutal setback amid a dynamic start to his career. The Texans believe their rookie quarterback suffered a torn ACL during practice Thursday, Ian Rapoport of NFL.com reports (on Twitter). He’s already set for season-ending surgery, according to John McClain of the Houston Chronicle (on Twitter). Without Watson, the Texans will turn to Tom Savage as their starter on Sunday against the Colts. Savage, of course, began the year as Houston’s starter before getting the hook in favor of Watson. Given Savage’s iffy start to the year, Houston might want to at least consider some outside options. The trade deadline has come and gone, but there are still experienced QBs on the free agent market. Of course, Colin Kaepernick is among those without work and many are already calling on the Texans to consider him. There will be increased pressure on Houston to at least audition him in the wake of owner Bob McNair‘s controversial comments. Already down J.J. Watt and Whitney Mercilus, losing Watson is a damaging blow considering the promise he’s shown and the franchise’s recent history with quarterback struggles. Watson was on the verge of putting together one of the best seasons ever from a rookie passer. He’d thrown 19 touchdown passes this season, with 18 of those coming in a dominant stretch over the past five Houston games. The No. 12 overall pick in the 2017 draft went 3-3 as the Texans’ starting QB while completing 61.8% of his passes. Watson tore his left ACL at Clemson in 2014 but returned to become a Heisman Trophy finalist a year later. He’ll look to make a similar turnaround for Houston in 2018. Browns Eyed Trubisky, Mahomes, 2018 QBs Over Watson? For the second straight year, the current Browns front office is set to observe the team face a rookie quarterback upon whom it passed in that year’s draft. After Carson Wentz and Dak Prescott faced the Browns last season, Deshaun Watson will match up against the team he was often linked to in the pre-draft process. But the Browns evidently had a multi-layered thought process behind moving past Watson, with Mary Kay Cabot of cleveland.com reporting the team had Mitch Trubisky, Patrick Mahomes and Watson as their top three quarterbacks and likely in that order. The Browns also bypassed Watson with their No. 12 pick in order to pick up a future 2018 first-rounder — their second high-2018 draft choice acquired from the Texans this spring — because of what’s being viewed as a superior class of quarterbacks likely set to be draft-eligible, Cabot reports. With two first-round picks and three second-rounders next year, the Browns would like to be “well-positioned” to draft a quarterback in the event DeShone Kizer is not their long-term solution. 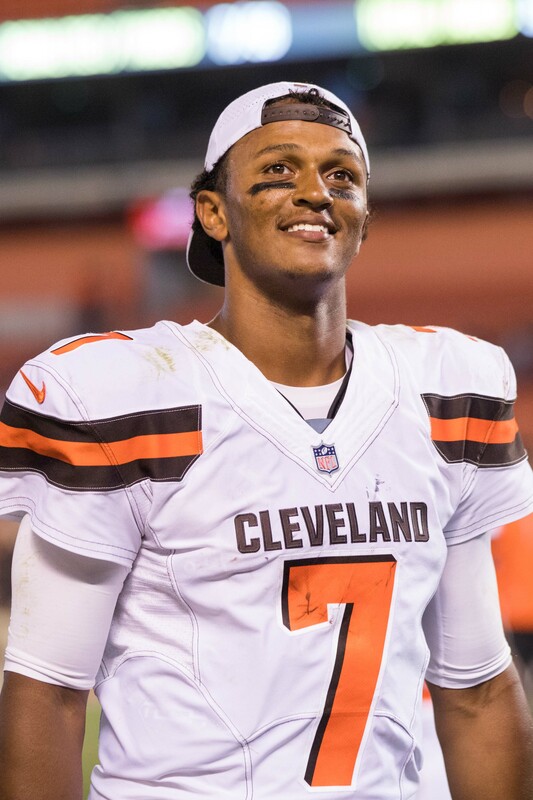 Considering Kizer was just benched for what Cabot notes will likely be for at least three games through the team’s Week 9 bye, that clock is ticking. 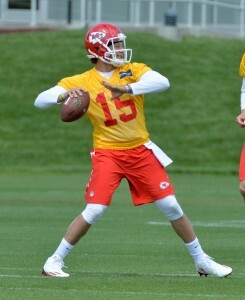 Cleveland may well have taken Mahomes, who had a private workout with the Browns before visiting the team in April, had the Chiefs not traded up to No. 10 and selected him, Cabot notes. 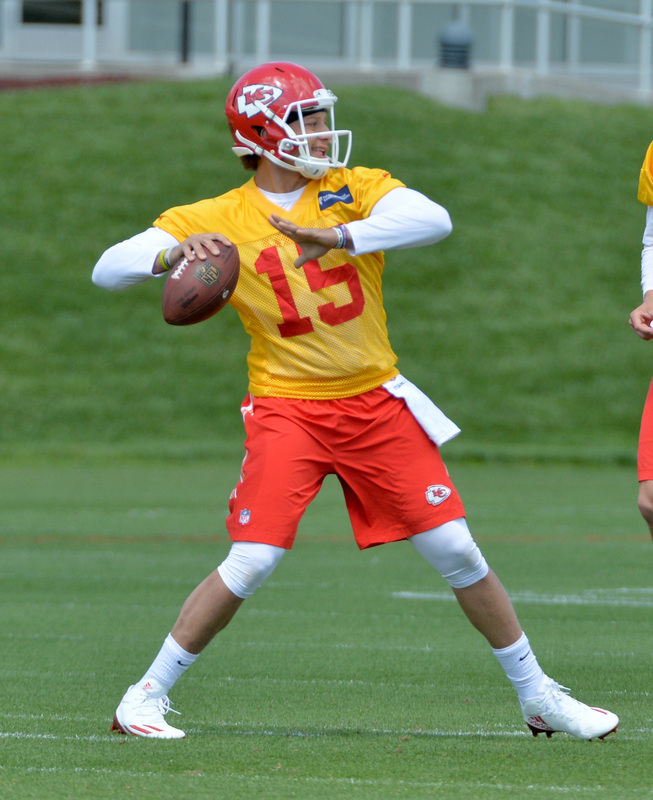 Kansas City’s brass obviously shared the Mahomes-over-Watson line of thinking. The longtime Browns reporter adds some in the front office did want to draft Trubisky No. 1 overall, leading to “heated debates” before Hue Jackson and Gregg Williams‘ preferred player, Myles Garrett, went to Cleveland at No. 1 overall. Jackson declined to say this week if he advocated for Watson, who has accounted for 10 touchdowns the past two weeks. The second-year coach also declined to speculate whether coaching Watson in January would have endeared him more to the team. The Browns not viewing Wentz or Watson as the kind of game-changer they coveted is being scrutinized now that Kizer has been benched for 2016 practice squad signee Kevin Hogan, who has outperformed the second-round pick when summoned this season. Viewing this demotion as a “temporary timeout,” Jackson anticipates returning to Kizer this season. The Browns are planning to obtain more evidence he’s the future to determine if the Notre Dame product is worthy of bypassing a signal-caller with all five of their 2018 first- or second-round picks.